Cross Sections used in Root Cause Failure Analysis - SEM Lab Inc. 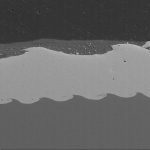 The terms microsection and cross-section and metallography all refer to essentially the same process, which has been in use for a very long time. Metallographic cross sections used in root cause failure analysis, such as the first example shown below, were prepared using standard metallographic practices to document the “wave pattern” and other features of the explosively bonded material. The same standard metallographic practices are used to microsection electronic components, printed wiring boards, solder joints, etc., which are typically combinations of metallic, ceramic, and polymeric materials. Preparation of microsections is more difficult for combinations of soft materials (metal & polymers) and hard materials (ceramic & semiconductors) because the soft materials polish at a faster rate than the harder materials. Nevertheless, it is worth the effort because root cause failure analysis often requires examination of microscopic material details such as microstructure, grain size, porosity, deformation, etc. that would be difficult or impossible to examine using other techniques. A BGA solder joint cross section. Multi-layer chip capacitor (MLCC) cross section. Plated thru hole (PTH) – via cross section. Light emitting diode (LED) cross section.